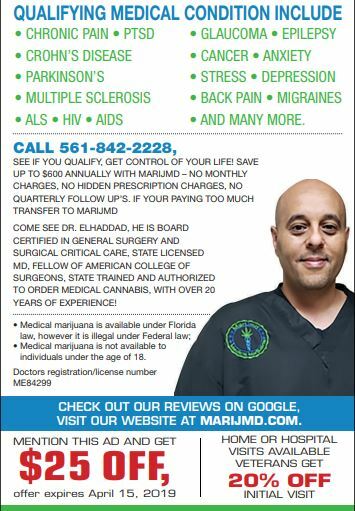 OUR BOARD CERTIFIED LICENSED FLORIDA PHYSICIANS HAVE BEEN TRAINED AND STUDIED THE ART OF MEDICAL MMJ. Dr. El-haddad was born and raised in New York City. He moved to Florida to start college at the University of Miami, where he earned his Bachelor’s Degree in Science. He attended medical school at the University of South Florida and did his training in Surgery at Ryder Trauma Center and Jackson Memorial Hospital part of the University of Miami Residency program. He is double board certified in General Surgery and Surgical Critical Care. Dr. El-haddad currently works full time at St. Mary’s Medical Center as a Trauma Surgeon and Critical Care specialist. He is compassionate and caring and studied the beneficial effects of medical MMJ for many medical conditions. Dr. El-haddad has completed all continuing medical education requirements and is certified by the State of Florida to certify patients. Come meet Dr. El-haddad and he will help you get state certified. If you are diagnosed with one of the qualifying conditions, medical MMJ may help you conquer that condition!